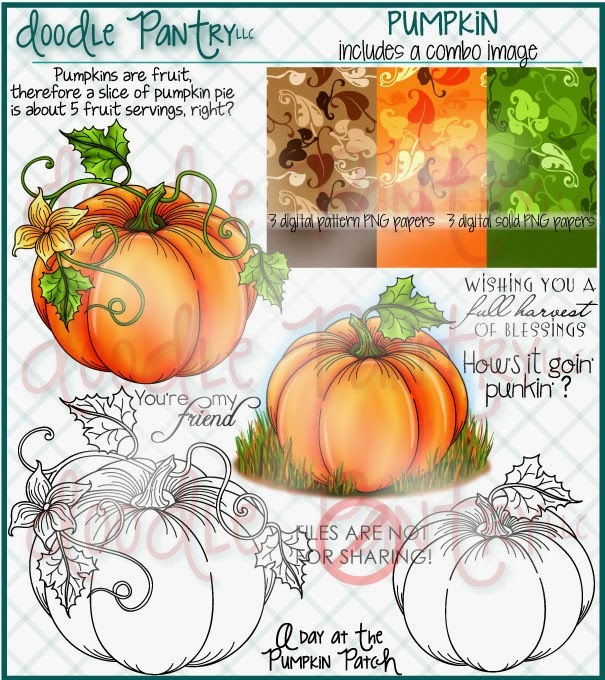 This card was created using the brand new set from Doodle Pantry called Pumpkin. This is actually your last day to get this set FREE/WITH PURCHASE. This is a phenomenal set and you get tons of pumpkins in this set, including beautiful white pumpkins. To make this card I used one style of one of the orange pumpkins (PRE-COLORED) and duplicated it 3 times. The two on the left where flipped horizontally using my image software. A white pumpkin (PRE-COLORED) was added in the middle and made to appear in front of the others. The image was then brought into the Silhouette Designer software program and I traced it to get an outline cut. I then did a print and cut. The cornstalk is a cut-file from Silhouette's online store. I cut it in white and then used various Stampin' Up! inks and finger sponges to color it (Garden Green, Wild Wasabi, Soft Suede, Baked Brown Sugar and Daffodil Delight). 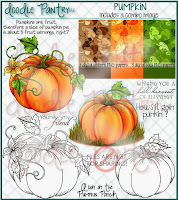 The gorgeous designer paper is also from the Pumpkin set. I typed the sentiment in Microsoft Word using the Chiller font and printed it on white card stock. It was then punched out using the Decorative Label punch from Stampin' Up! and distressed around the edges using Basic Black and Soft Suede inks. The card was assembled with a brown card stock base and adding the designer paper on top of that. I cut a 5" square piece of white card stock and distressed it with Baked Brown Sugar and Soft Suede inks. The colored cornstalk was glued down onto the white card stock, leaving just two of the husks unglued. The sentiment was glued between the husks and then the final husks were glued down. The row of pumpkins was added last and they were added using pop dots to raise the image off the page. Remember that in addition to being the last day to get the Pumpkin set free w/purchase, it is also the LAST DAY to enter the Doodle Pantry Blog Challenge #38 for a chance to win a Doodle Pantry gift certificate and receive the Jingle Ants set free. Stay tuned to the Doodle Pantry Blog because there are some great changes coming October 1. Susan your card is so cute! Cute enough for me to run right over to Doodle Pantry, make a purchase and get these darling pumpkins free. Thank you for a wonderful card and the pumpkin tip. What a fabulous card! Everything just pops for me, Susan! This is awesome! I love it! Thank you so much for sharing this with us at Cupcake Inspirations! wow Susan this is fantastic love the way you added all your elements to the card. Great job. Thanks for joining in the fun with us at Created with love challenges. You are a computer genius, not to mention cardmaker extraordinaire. Beautiful job Susan! This is amazing and gorgeous all wrapped up in one beautiful card. I love love love love this card of yours!!!! Wow, this is a knockout! Love everything about it, Susan. Gorgeous scene! You do awesome work. I never would be able to work my computer in that fashion. This is adorable! I love how you pieced the image and the sentiment is just perfect! cute! Thank you for linking up with us for Tara's linky party at Craftin Desert Diva's We hope that you will join us again for the next linky party! Lovely card! Thank you for sharing your creation with us at Cupcake Inspirations. What a great card ! Love the sentiment and those pumpkins are too cute ! Thank you for joining us at Pile it On Challenges ! Fab card! Thanks for joining us this week at Created With Love Challenges for our Fall Colors Challenge! Lovely card! Thank you for joining the TTCRD challenge and good luck to you. Fantastic card! Love the beautiful images! Your design and sentiment are fabulous! Thanks for sharing with us at Incy Wincy! Wow this is wicked cool I love love this. Thanks for joining us at Great Impressions. This is very pretty. I love the water color effect on the corn. Such an awesome card! I love the sentiment you paired with everything!! Thanks for joining us at Digi Makeover! Awesome Susan, love the design and your detailed description of the making of it. Fabulous! This is another great scene you have created. You have such a knock for making rustic, country scenes! Love it! Love this Pumpkin Card ! Tks for joining the last Challenge at the House of Gilli ! Hope to see you again in our next challenge that will be launched soon !